It is only the second week of school and we are already changing things up in the lunch basket. I got a new lunch container to try from Healthy Kitchenware. 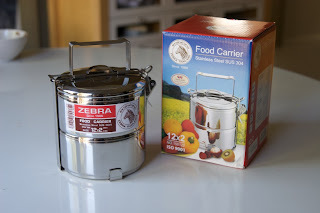 It is a two-tiered stainless steel container with lid and handle, also know as a tiffin carrier. You can find them many places, but this one in particular is really well made. I thought it was a great way to send both a hearty snack and main course, since this year I have to pack both for my son. And hey, the container has helped my guy be more excited about his lunch. That in itself is a good thing! and please remember to send me pictures of the lunches you're packing! all ideas are welcome for containers, recipes, etc. moms everywhere will thank you. There are 2-tier, 3-tier, 4-tier tiffin lunch box containers and the unusual pyramid-shaped ones at http://HappyTiffin.com. The main differences are the diameters of the stainless-steel containers - small through large, meaning large enough for one tier to hold a pound of coffee or big sandwich! The Pyramid versions have a lid on top of each tier which make them great for soups and other liquids. And they have 15% off through the end of the year with "happytiffin" coupon code. I bought my dog one so i could take her kibble and water w/me in the car. So far so good!